A 26-year-old man has died in Yeovil District Hospital after a suspected drugs overdose at the Glastonbury Festival at Worthy Farm in Somerset. The man, believed to be from the West Midlands, was found unconscious by festival staff in the Park Farm area of the site early on Saturday. A spokesman for Avon and Somerset police said that a full post-mortem examination would now be carried out. His death is not being treated as suspicious, he added. 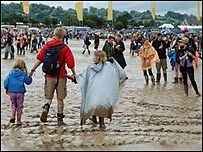 Police said crime at the festival at this stage was "slightly down" on 2005 but the number of arrests were "well up". The spokesman said this increase was due to the "proactive operation" of both police and security on site. By 0900 BST on Sunday there had been 236 reported crimes, down on the 267 incidents at this time in 2005. Of these 158 were drug related, compared to 183 in 2005. The main non-drug related crime continues to be theft from tents with 41 reported incidents - but with 30,000 more people on site than the last festival. Police said that so far 160 people had been arrested - the vast majority for drugs related offences. More than 1,000 festival-goers have suffered minor ailments. Thirty-two have needed hospital treatment. Numbers at the site are expected to increase on Sunday because of day pass visitors.